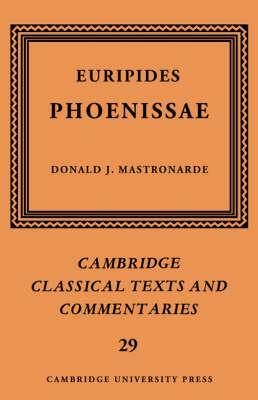 This volume provides a thorough philological and dramatic commentary on Euripides' Phoenissae, the first detailed commentary in English since 1911. Phoenissae is of special interest both as a specimen of late Euripidean dramaturgy, and as the subject of longstanding disputes over the extent of interpolation and rewriting to be detected in it. This commentary aims to offer a balanced treatment of issues of language, style, structure, and dramatic technique as well as to explain the reasons for and uncertainties of the constitution of the text. The introduction treats the play's structure and themes, the possible date, the features of the original production, the varied background of Theban myth against which Euripides' choices and innovations may be judged, and general issues relevant to the problem of interpolation. The Greek text is that of the author's 1988 Teubner edition. Introduction: 1. The play; 2. The problem of date and companion plays; 3. Features of the original production; 4. Thebaid myth and Phoenissae; 5. The Peisander scholion and Chrysippus; 6. The problem of interpolation; 7. The text; Phoenissae; Commentary; Appendix: The poetic topography of Thebes; Abbreviations and Bibliography; Indexes.